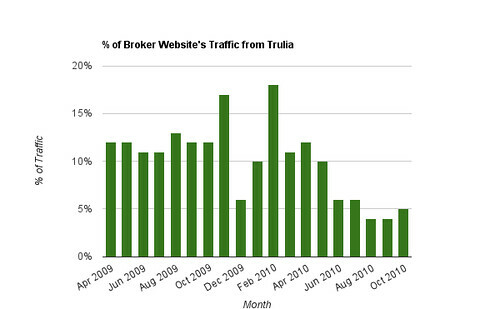 How Trulia Dependent is Your Broker Website? 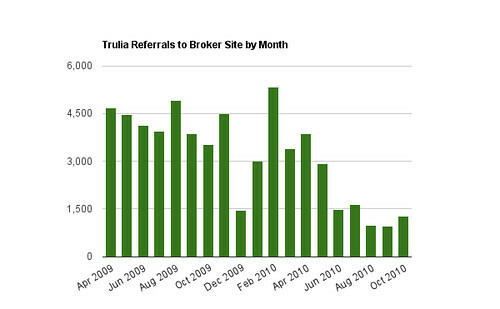 One of the most interesting shifts in real estate broker traffic that I’ve witnessed in recent years is the shift in referrals brokers are receiving from Trulia.com. So, what’s going on here? As far as I can tell, Trulia has decided that they want to keep home buyers on their site, where they can show them more ads, and force agents and brokers to pay for premium memberships. They are getting real estate agents and brokers to pay to look good next to their own listings. It’s quite brilliant, for Trulia. But, it doesn’t have to be that way for brokers. Based on conversations I’ve had with brokers over the past year, many brokers have slipped into a Trulia-dependent mindset. Actually, it’s a syndication-dependent mindset. They seem to think that they need to give away the listings their agents have worked hard earn, document and publish in order to earn traffic back from sites like Trulia. In fact, quite a few major franchises have recently stated that they plan to syndicate their listings to as many as 500 different syndication sites around the web. 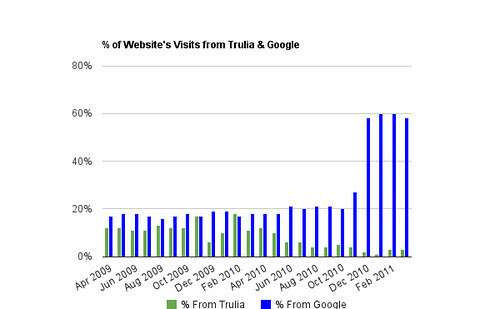 What happens when each of those 500 sites adopts a model similar to Trulias? Will agents cough up $39.99 (or more) per month to look good on each of those sites? Under that scenario, the only people not making money would be the agents. 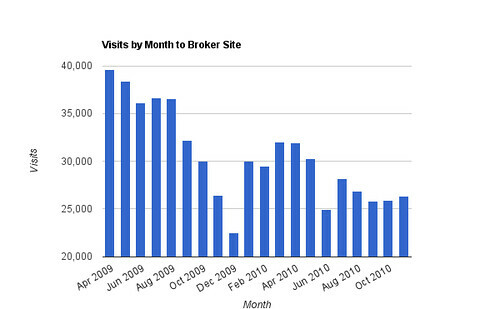 As you can see in the above chart, traffic from Trulia has rebounded slightly since this broker partnered with WhereToLive.com. This was due to seasonal market conditions. 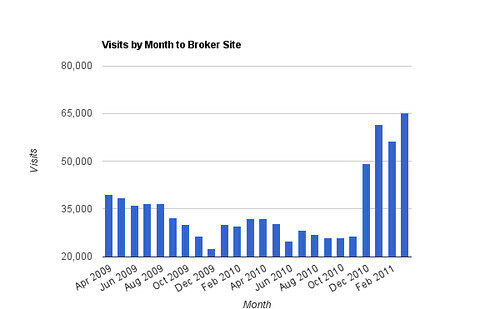 However, something changed dramatically: the volume free traffic from Google that this broker’s website earns. Lots of free traffic. Highly qualified traffic. 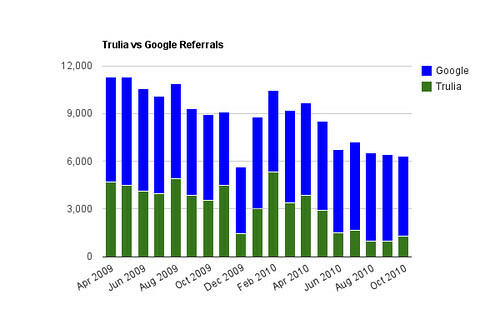 While Google was already a larger source of traffic than Trulia, it now dwarfs Trulia as a traffic source. This traffic had previously been ending up on Trulia and other online competitors’ websites rather than on the broker’s site with the original listings. Clearly, this broker is better off having this traffic on their own site. This broker has earned back a position as a destination site in their local market. 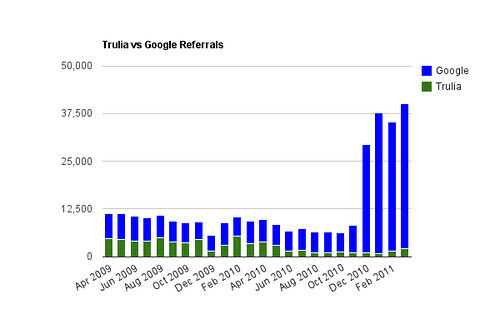 They’re still syndicating listings to Trulia, but they’re much less Trulia-dependent than they were a year ago. And Google isn’t trying to charge agents $39.99 to $149.99 a month to look good next to their own listings. If you’d like to run the numbers for your own site, log in to your Google Analytics (or other stats program), click Traffic Sources > All Traffic Sources, then increase the timeframe to the past two years. Or, give us a call and we can walk you through it.